Long tail keywords and their research date back at least 13 years. While there’s been many changes in this industry during this time, this approach remains relevant and important today. In fact, with so many voice-activated products (e.g. Amazon Echo, Google Home) entering our homes today, it’s becoming a necessity once again. In the not so distant past we’d turn to our friends and neighbors for information on products and services. This power of the spoken word continues today. It’s proven a highly effective marketing method – both online and off. Today, we have products that enable voice-activated search in our homes. These will change how we consume and market information. Some SEO marketers predict we’ll use these to conduct at least 30% of our internet searches by 2020. This is something we must pay attention to when trying to sell our products and services because it means the return of the long tail keyword. You must carefully consider how the spoken word is different from what you’d type. For instance, you may type “sushi Pittsburgh,” but you’d say “What’s the best sushi restaurant in Pittsburgh?” It’s only natural that we treat these voice-activated products more like people and talk to them in a conversational tone – even saying please and thank you sometimes. You need to consider your customer’s journey. Consider where they’d start if their ultimate goal is to purchase your product or service. If they decide they want sushi, they may also decide they only want sustainable ingredients or unagi preparations. This is all information you must include in your website’s SEO will help you pop up in searches as a relevant option. Make sure your content is framed as an answer for your users’ questions. This is different from telling someone information you want to share with them. For instance, if someone asks, “Why’s my cable bill so high?” They’re likely to click on a blog titled, “Why Your Cable Bill is so High and What You can do About It.” To see what people are asking about your niche, use Google’s auto-search feature. When you see what auto-populates, start writing blog posts, FAQs, and messages about these things. By doing this frequently you’ll be able to add a lot of fresh content to your site that will get you noticed. Optimize your content with descriptions and complementary offerings. For instance, if you’re selling TVs, you’ll want to offer information about TV accessories (e.g. HDMI cables). You can also link to reviews of these additional products even if you don’t sell them yourself. It’s time for your SEO thinking to evolve to be more relevant to meet your customers’ needs. This is precisely what happens with long tail keyword marketing. As we continue moving towards the use of more voice-enabled devices it’s critical that our marketing efforts make this transition too. As such, today’s marketing professional is taxed with the job of crafting consistent stories that answer their customers’ questions. 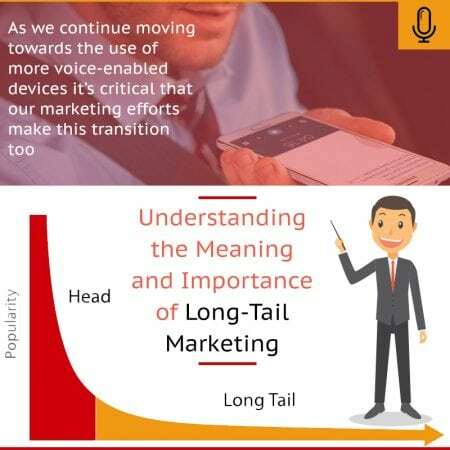 This is growing more challenging in an era where search habits are shifting towards the use of more voice-enabled devices. Fortunately, you have an ally on your side: At Local SEO Tampa we’ve helped many businesses with long tail keyword and we look forward to helping you too.